Hello everyone! Today I have a card for The Card Concept #75 Challenge. This is actually the 2nd or 3rd card I've created for this inspiration image. I like the contrast of the bold graphic on the wing backed chairs with the more neutral and muted tones of the rest of the room. That was the look I wanted to mimic so I started over. For my card, I started with a piece of Rose Gold Foiled Patterned Paper for my background panel. This is some of the leftover paper I have from a Wedding Scrapbook Album I made recently and I love it so I've been using bits of it here and there in my cards when I can. It's a charcoal colored background with the Rose Gold Foiled leafy branches and berries. I die cut a panel of it using the Gift Card Layers Die from WPLUS9. 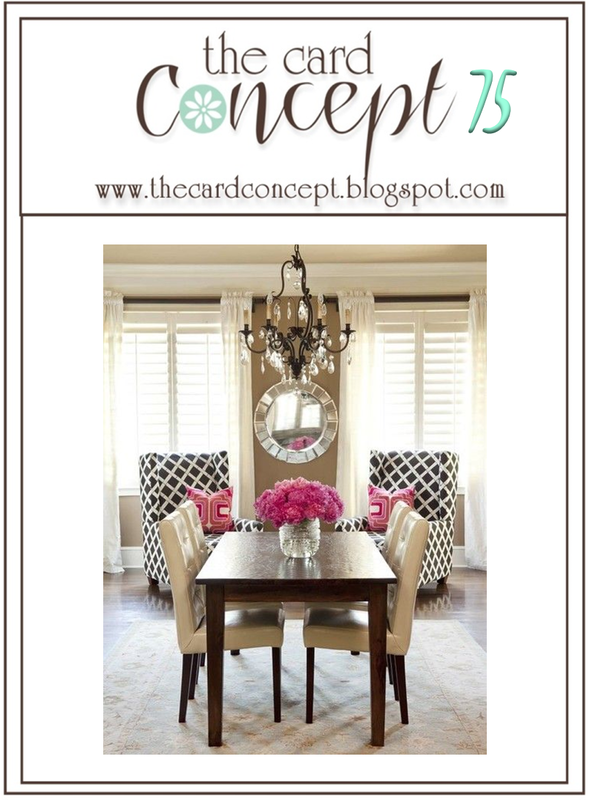 The pale pink ombre paper is also from the same paper pack and I used it to mimic the lines of the dining table going through the center of the room in the inspiration image. I cut it on three sides (top, bottom and one side) then re-aligned it the die to get the stitching line on that 4th side. You can feel when the paper slips into the stitch line so that you know it is lined up correctly. It isn't hard to do but it takes a little bit of practice. I like for all of my pieces to have the stitched lines so I figured out how to do this early on in card making. I don't particularly like cuts made by blades but prefer to have the crisp edge of a die cut. I did use only a trimmer for the top and bottom of the sentiment strip that goes all the way across the card. The "friend" die cut is a favorite from Mama Elephant cut from Rose Gold Foiled Cardstock that I found at Michaels. I used a scrap of a pale pink card stock on top of a piece of Charcoal Cardstock for the horizontal strip. I laid it across the Gift Card Layers die and ran it through my die cutting machine so that the sides would have stitching on them to match the background panel. The leaves are Papertrey Ink's Fancy Foliage Details Dies and work so well with this paper because they are outline images. The card is assembled onto a top folding card base made from Stamper's Select White. Thanks so much for stopping by today. 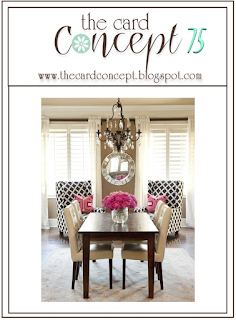 Be sure to pop in over at The Card Concept Blog for more inspiration and to enter your own card into the link up. Thanks for spending a few minutes with me today. I hope you'll come back soon! Tres chic! All that shimmery foiling is a sight to behold! I love your gold and black combination! Very elegant and very fancy too! Yes!! Stylish does describe your card so well. I love the delicate elements you have used. The rose gold is so scrummy. Special Sales in the Altenew Shop!